As Duck demonstrates his bicycle riding skills to each of the other animals, we hear their critical opinions of a duck riding a bike. Then an opportunity arises that gives all the other animals access to wheels as well and none can resist! 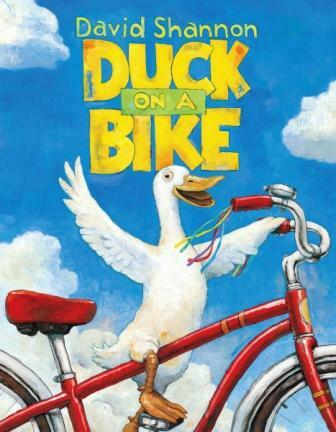 Just thinking of a duck (or any other animal) on a bike is funny and David Shannon adds hilarious illustrations that tell as much of the story as the words do. This humorous tale is entertaining but also keeps that sparkle alive that animals can do anything we can do (ever see that video of the dog riding a bike or Tyson, the skateboarding bulldog?) and anything is possible. I also like the subtle message regarding negativity and how it may be rooted in envy or jealousy. Giving the other animals the same opportunity erases the negativity. Duck is a leader and a risk-taker and makes a funny but fine feathered hero. My daughter and I have read this one numerous times and it never gets old.